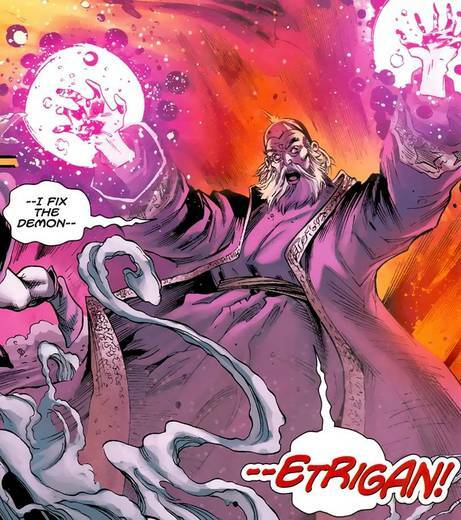 300 - Merlin is born the half-human son of the Demon Belial, the father of Etrigan. He begins walking the earth reassembling magics lost after the fall of Atlantis to fight his brother's inevitable assault on the mortal plane. 396 - Merlin battles the sorceress Circe, trapping her on her island. 423 - Merlin drafts the Eternity Book, the forerunner to all spellcraft. 462 - Merlin attempts to begins his plans to stop Etrigan with Uther Pendragon, but is undone by the Uther's mortal weakness. 475 - Merlin gives Excaliber to Arthur, aiding him as he becomes a warlord. ​478 - Merlin takes Morgaine Le Fay as an apprentice. ​483 - Merlin and Morgaine Le Fay become lovers. ​489 - Merlin rejects Morgaine Le Fay because of her hunger for power. She swears revenge. ​490 - Arthur's revolt against the Saxtons begins. ​491 - Merlin begins planning to use Jason Blood, a young member of the Druids of Cymru that joined Arthur's rebellion, as a vessel to contain his brother. ​500 - Merlin helps to build Camelot when Arthur's revolt succeeds, ushering in an age of promise for man. ​502 - Merlin begins to forge the pathways to the Region Beyond, exiling the magical forces of England into it. 503 - Merlin debates the role of magic in man's future with Blackbriar Thorn. ​504 - Merlin is nearly defeated by his former student Morgaine Le Fay, and saved by Sir Justin, who he gifts with his enchanted armament. 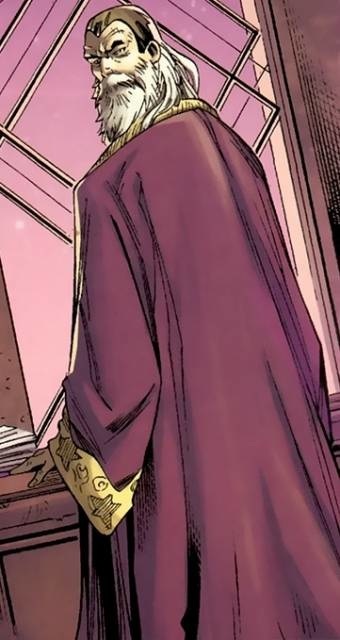 510 - Merlin takes Morgaine Le Fay's sister Nimue Inwudu as a pupil after her magical connection to her sister is severed by the Phantom Stranger. 517 - Merlin bonds Jason Blood to Etrigan after he betrays Camelot to Morgaine Le Fay, severing her connection to her demonic benefactor. He forges the 2nd Shadowpact to close the hellfonts, assisted by Blood, Ninmue & Blackbriar, but he is betrayed by Blackbriar and disconnected from the mortal realm. ​It's pretty wild that so many public domain characters are actually part of DC's continuity, but there's absolutely precedent for it; Marvel has been doing pretty well with their version a certain hammer-wielding public domain character. Characters like Superman and Batman have been traveling back in time to Arthur's court throughout their history, so it was only a only a matter of time before DC developed it's own version of Arthurian legend. With modern characters like Etrigan, Shining Knight, and Janissary all having ties to Merlin in their history, he's a clear candidate for the first character of that era that we include. We made an attempt to lean about actual Arthurian legend before we incorporated the DC standard version of these characters into our timeline, and we discovered an amazing wealth of study into the development and history of these stories. Arthurian legend as we know it developed over centuries, and still grows to this day; The study of these stories is something people have devoted long, illustrious careers to. Just the few afternoons reading about it to make sure that our DC-centric version of the characters fit into the larger tapestry of Arthurian legend were extremely pleasurable, and I highly recommend you try it. In addition to Merlin's status as a half-demon, He's obviously one of the most important magic users of all time, and as such we've made him the crux of the second Shadowpact. It's a lot of fun to weave these disparate story threads into a cohesive whole... it a lot of ways, it's what makes this entire project what it is.